Species name meaning 'differing from?'. Trichosanthes theba Buch.-Ham. ex Wall. Thickets on mountain slopes, up to 1500 m elevation. The flowers bloom for just one night, then fall off. Although the flesh of Hodgsonia fruit is inedible and considered worthless, the large, oil-rich seeds are an important source of food. The kernels are occasionally eaten raw; they are slightly bitter, possibly due to an unidentified alkaloid or glucoside, but "safe" to eat. More commonly, the seeds are roasted, after which they taste like pork scraps or lard; many mountain peoples consider these roasted seeds a delicacy. In addition to eating the seeds alone, the Naga incorporate them into various types of curry. The medicinal importance of Hodgsonia is mostly in its leaves. 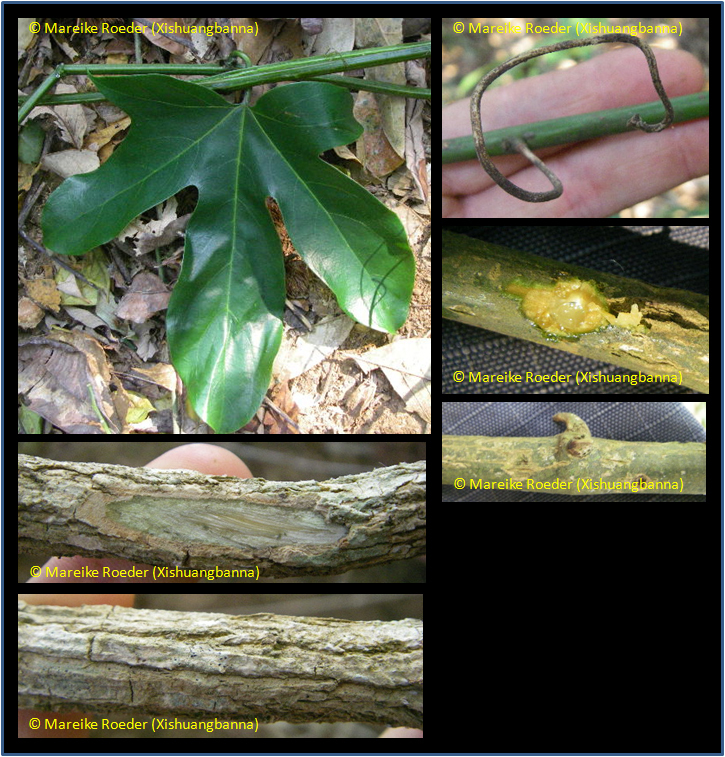 In Malaya and java, native physicians report several uses for the nose for the related species of Hodgsonia. The leaves may be dried and burnt, and the smoke inhaled, or the juice of young stems and leaves is squeezed into the nostrils to allay irritation from small insects. The leaves are also boiled and the resulting liquid taken internally, both for nose complaints and to reduce fevers. The ashes from burnt leaves of related Hodgsonia macrocarpa are also used to heal wounds. In Nagaland, the fruit bulb is applied to bacterial infections in the feet. In Sarawak, Hodgsonia oil is used to anoint the bodies of mothers after childbirth; it also forms the base of embrocations carrying ashes from the leaves of coconut palm and Kaempferia. The oil is also used as a base for medicines in Eastern India. Commonly used for food within its native range, the plant has only been brought into cultivation since the 1970's, and is now an economically important oil plant in southwest Yunnan. From Bhutan and India to southern China and into Indochina. English: Kadam seed, Kapayang, Lard fruit; Chinese lardplant. India: Sikkim (Lepchas): Kat'hior-pot; Nagaland: Assa; Kolasib: Khaum. Vietnam: Béo, Ké bao, Muróp rùng, Dây sén.